A truly great man is ever the same under all circumstances. And if his fortune varies, exalting him at one moment and oppressing him at another, he himself never varies, but always preserves a firm courage, which is so closely interwoven with his character that everyone can readily see that the fickleness of fortune has no power over him. For President Barack Obama, the last two months of his eight-year Presidency will be an agony. Perhaps only his wife, Michelle, truly knows the torments he will so stoically endure. For stoicism–enduring pain or hardship without complaint or showing emotions–has long been central to Obama’s character. In 2011, two years into his Presidency, he faced an accusation never before leveled against an American President: That he was not an American citizen–and thus not entitled to hold the office he held. His accuser-in-chief: Donald Trump, an egomaniacal, thrice-married “reality-TV” host and real estate mogul who had filed for corporate bankruptcy four times. At first Obama ignored the accusation, assuming it was so ridiculous no one could believe it. But, promoted by Right-wing Fox News and Republican leaders, millions of Fascistic Americans thought it actually might be true. 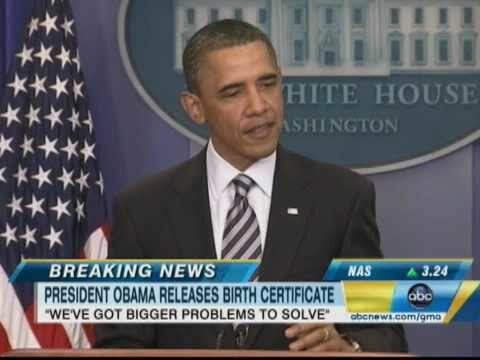 So, on April 27, 2011, the President called a press conference–where he released the long-form version of his Hawaii birth certificate. “We do not have time for this kind of silliness,” said Obama, speaking as a father might to a roomful of spiteful children. “We have better stuff to do. I have got better stuff to do. We have got big problems to solve. And on May 1, the President announced the solving of one of those “big problems”: Osama bin Laden, mastermind of the September 11, 2001 terrorist attacks, had been tracked down and shot dead by elite U.S. Navy SEALS in Pakistan. On April 14, 1865, the slavery-sympathizing actor John Wilkes Booth enters Ford’s Theater in Washington, D.C.
His mission: Assassinate President Abraham Lincoln. Armed with a knife and Derringer, he reaches the unguarded Presidential box. But just as he’s about to push open the door to his–and Lincoln’s–destiny, he halts. He’s just thought of a more monstrous fate for the President. Silently, he leaves the theater–and the world never learns how close Lincoln came to death at the hands of an assassin. Instead, Booth waits out the next four years–until the election of 1868, when Lincoln’s second term is up. Lincoln has chosen Andrew Johnson, his Vice President, to succeed him. The Thirteenth Amendment, which bans slavery. The stationing of Union troops in the South, to ensure that blacks are not re-enslaved. The granting of the vote to blacks. Suddenly, an unexpected challenger steps forward: The celebrated Shakespearean actor John Wilkes Booth! Booth promises that, if elected, he will overturn everything Lincoln has done–most especially the Thirteenth Amendment. He’ll tear up the surrender treaty that officially ended the Civil War and let the Southern states restore the Confederacy. He calls the President an ape, a buffoon, a dictator with the blood of countless Americans on his hands. Newspaper reporters covering Johnson often fall asleep during his speeches. Booth whips up his audiences without even trying. On November 4, 1868, John Wilkes Booth becomes the seventeenth President of the United States. It won’t be until 1933 that Presidents begin taking the Oath of Office on January 20. So Abraham Lincoln will remain President until March 4, 1869. Meanwhile, John Wilkes Booth has never held public office. He needs to pick a cabinet and learn the basics of what it means to be President. And only one man is qualified to teach him–the man who now holds that office. Lincoln knows that, in only a matter of months, everything he has worked for will be ruthlessly overturned. Like a beautiful garment pulled apart, thread by thread, until nothing is left but a pile of rubbish on the floor. But he is a patriot, and a believer in destiny. Fate–or God–has thrust him into the Presidency. And he will carry out the duties that go with that role, however tormenting they now are, right to the end. He hopes that Divine Providence will bestow a bright future on his beloved country, however bleak its present now looks. When Barack Obama entered the White House in 2009, he couldn’t imagine spending his last two months in office tutoring the man who had reviled him throughout his Presidency. It will be his last gift as President to a nation that has often proved ungrateful for his dedicated service.